Leopard print? Check. A liberal smattering of studs? Check. Yep, this bag has to be a Betsey! With the Kat's Eye hobo, Betsey Johnson delivers just the kind of purse her fans love. It’s glitzy, gaudy, and more than a little bit kitsch. It's not likely to impress fashion snobs, but it doesn't want to. Betsey Johnson knows her fan base, and she caters to their every whim and fancy here. It's easy to pick apart this purse. The black leatherette is so shiny that it looks cheap, and the studs clash against the leopard spots, but so what? It demands attention, and if it has to cut a few corners to keep the price under $100 so be it. Betsey Johnson doesn't skimp where it counts though. This hobo is enormous, but it's got enough pockets to ensure it doesn't feel unmanageable. The shoulder straps are long to help you grab and go, and they're jazzed up with fun zippers on the sides. The Kat's Eye hobo won't suit those of us with conservative tastes or fat wallets, but if you love to walk on the wild side with Betsey you'll lap this up. 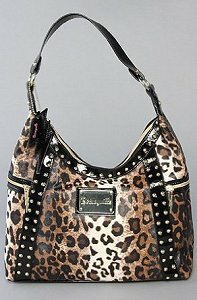 The Betsey Johnson Kat's Eye tote bag, a great alternative to this hobo bag.